How was your weekend? We had a good one overall. I did not get to the Music Fest, due to obligations that arose. The press passes never came through and then Peter's HS Baseball team had a playoff game on Saturday. Sunday was wet and fugly, so I sat and watched some of my Yankees and some Grizzlies. As a mater of fact, that is what I am doing as I type this. The BLUES MUSIC AWARDS are this Thursday. Held in the Home of the Blues, Memphis, TN, I will be there to cover it for American Blues News and to do some networking for Music On The Couch for future guests and for some special opportunities I am working on for late 2011 - early 2012. There are some opportunities that are making their way into my life from several directions and it could greatly impact the way my world looks in the next year or so. It appears EVERY SINGLE PERSON in the Oklahoma Thunder arena is wearing a blue shirt. Not just most of them, but every single person the camera shows...OH WAIT, there is a guy in a red shirt. Wonder if he makes it out alive! Of course he does, this is middle America and nothing bad ever happens in middle America, right? Krista Parrish comes to The Couch through a suggestion by our friend Dusty from RoboDrum. This young lady is a must hear. Her music is intelligent and her vocal range is astounding. That might be enough to have you come listen, but adding to that, Ms. Parrish is a smokin' guitar player. Her song "Mexico" was selected for the Gods Of Indie Guitar album this year. Last year Krista released Playing With Pendulums with bassist/husband Steven Murphy and drummer Michael Fazekas. A song off the album, "Easier Said Than Done" went to #1 on the indie music charts in the rock category. She was recently signed to Cinderella Records and we will discuss her explosive journey and what is on the horizon. Then we get to sit with Austin Young. 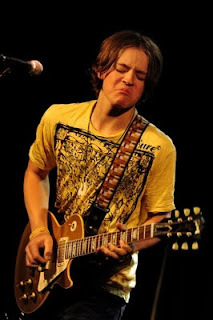 Austin is a 15-year old guitar sensation from Colorado. With his dad on drums and 16-year old Noah Mast on bass, they perform as Young Austin And No Difference. Austin plays what he has dubbed “Texandrix Blues” a blend of Texas Blues and Hendrix inspired guitar. Young Austin and No Difference were Semi-finalists in the band competition at the 2010 International Blues Challenge. How did Austin become so skilled on the guitar. What has he experienced so far and what is he looking forward to in the years to come. All this and music from their album Yesterday Is Gone. We will take your calls and questions for both guests at 1.347.633.9400. Come sit on The Couch and meet musicians you should know. The live interactive chat room opens 20 minutes before show time. Follow this link HERE and click on the Chat Now icon. Come hang with the fans and musicians who visit each week. Remember, unless you take the two minutes to register, you will not be able to participate in the chat room or send me questions to ask our guests, but you will still hear the show. So tune in on Monday evening or remember, you can always listen anytime after the show ends from the player HERE or check out Music On The Couch for additional artist information, and show recaps. You can download to your iTunes and even subscribe to the show for weekly automatic downloads, from my iTunes page. Music On The Couch is offering sponsorships at this time. Each week our listening audience is growing. Share your product or service with our listeners. Over 6,300 people have listened to MOTC in 2011! Those Grizzlies just keep on chugging along, don't they? I wasn't surprised that they took down the Spurs. It was a bad match up for SA. But if they pull off the upset of OKC, that will surprise me. My Lakers are up tonight. I'm thinking New Orleans might have woken them up and they won't come out flat. But this is my Lakers we're talking about, and they may have turned off the juice again. Very productive weekend here at Rancho Bondonio...'bout time y'all come on out!